Today’s Advent Calendar photograph comes to you courtesy of Wei Yuet Wong. I love that Wei Yuet has a broad range of cycling photographs – women’s races, cyclocross, the races in the Far East, as well as bringing his unique eye to the more iconic races in the World Tour calendar. CX World Championships Tabor: Sanne Cant and Pauline Ferrand Prevot. 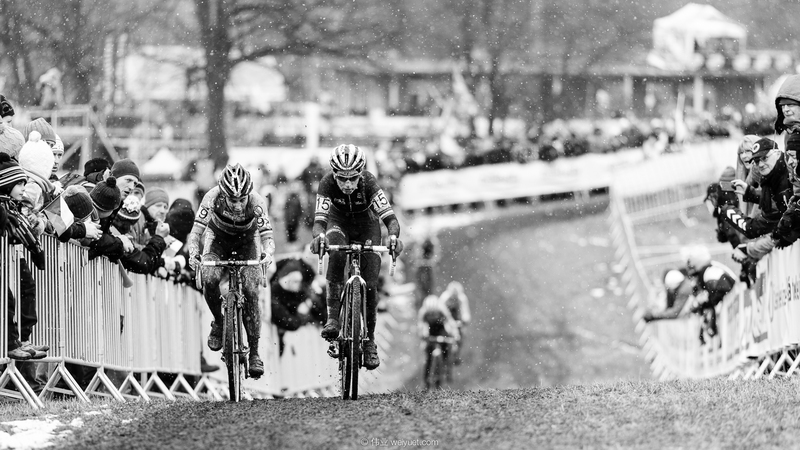 For a cyclocross race, all we ask for is snow, frozen course, mud, and crazy fans. As always, thanks to the women for making such a fantastic race for all! “When looking back at 2015, it’s easy for me to just remember all the low points. Coming off a relatively good 2014, I didn’t start the year feeling so up to par. I had some low emotions, though they were manageable. But, I guess I was getting careless at times and not very focused. The lowest was having all my things stolen after Stage 13 of the Giro d’Italia. I lost everything, except the things I had on my back. It was an quite an insight to see how few things I really needed to survive on everyday. Those months after the Giro were the lowest. I missed Le Tour, the Worlds, the autumn classics. But I did make it to the SEA Games (Southeast Asian Games) and made my first contributions to the Dutch publication, Soigneur. “Throughout the low times, I’d received many words of encouragement from many people, and they all had a common theme: accept what I had lost, and move on. It was a good lesson for me – letting go of things that I have lost, and letting go of things that I don’t need.